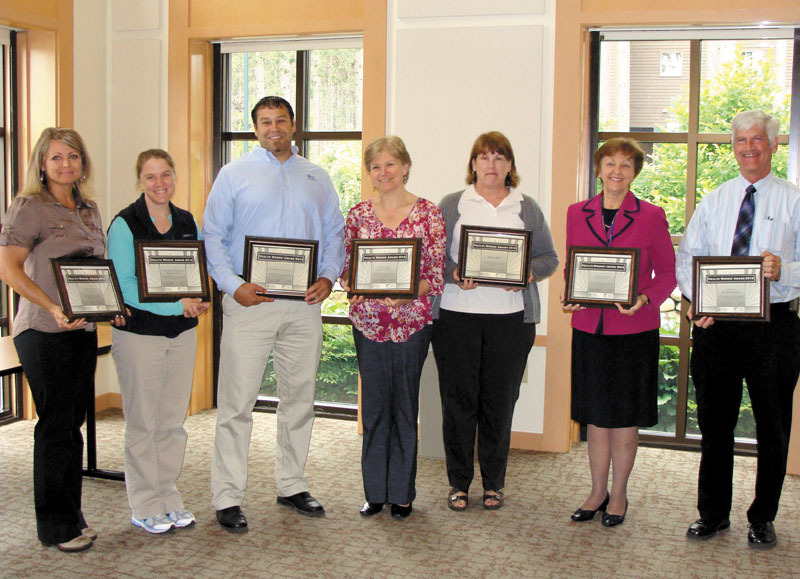 FARMINGTON -- The Healthy Community Coalition of Greater Franklin County recently presented 10 area businesses with Worksite Wellness Awards for their efforts in promoting good health for employees by supporting tobacco-free lifestyles, encouraging physical activity and promoting healthy eating. FARMINGTON — The Healthy Community Coalition of Greater Franklin County recently presented 10 area businesses with Worksite Wellness Awards for their efforts in promoting good health for employees by supporting tobacco-free lifestyles, encouraging physical activity and promoting healthy eating. The awards were presented at the June meetings of the Jay, Livermore, Livermore Falls Chamber and the Franklin County Chamber of Commerce. Gold recipients were: Franklin Community Health Network; HealthQuest Chiropractic; Leap, Inc; Star Barn Bed and Breakfast; Town of Jay; University of Maine at Farmington; and Western Maine Community Action. NotifyMD was a silver-level recipient, while Community Concepts and Safe Voices were recipients at the bronze level.